Situated on the west coast of Istria, Rovinj is one of the most popular and most developed tourist resorts in Croatia. The old town is built on the island, which was only connected with the mainland in the 18th century. 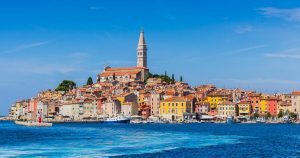 Known as one of the most picturesque and romantic towns on Mediterranean, over the last few decades Rovinj attracts a large number of tourists. Feel its breath of past times felt as you walk around old town’s cobbled narrow streets, admire the 22 islands and islets, enjoy in the mild Mediterranean climate, carefully designed parks, the tidiness of its streets, the friendliness of the local population or numerous and varied town events. Rovinj manages to combine, in a very interesting way, its rich tradition with the modern times. As it is also an active fishing port, you can experience the atmosphere of a small fishing village, especially during the popular fishermen’s festivities or at one of the traditional taverns . On the other hand, the town has been developing an exquisite gastronomy and offers a high standard of tourist services in general. The city at the foot of the Church of St. Euphemia is the favorite gathering place of artists from around the world. Walking down its streets, you’ll bump into many art galleries and studios, whilst once a year, in August, you have the possibility to attend the largest open-air exhibition of the Adriatic coast, which takes place in one of the main old-town streets – Grisia.